ADDIS ABABA, Ethiopia — I was high in the Mercato when Solomon, our driver, suggested we eat kitfo. 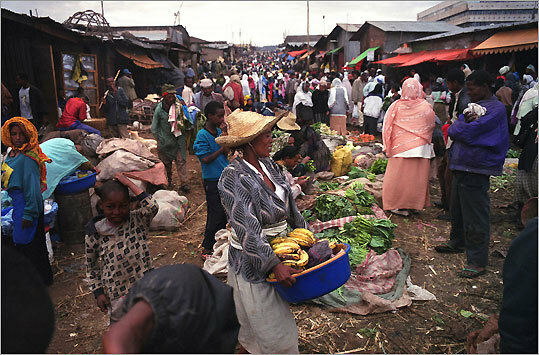 My girlfriend (now my wife) and I had traveled to Ethiopia to celebrate the millennium, and Solomon was showing us the sights of the capital, including the main market with its bazaars and stores. I say “high,’’ but the word does not adequately describe my state of crippling jitteriness. In my younger and more irresponsible days I was an ardent narcotic tourist, and it had seemed a good idea to eat chat, a shrub whose stimulating leaves are chewed all over the horn of Africa. In Ethiopia, it is a legal, social drug that produces a mild euphoria and genial chattiness in its users, who spend the afternoons lounging against sunlit walls, chewing like cows. But in me chat’s effect was entirely regrettable and isolating: It was as if I had quickly swallowed six or seven double espressos and a fistful of cold-remedy pills. The sun dizzied. Thus, when Solomon suggested kitfo, I said yes. In fact, food was the last thing I wanted, but I did need to sit down. A little quiet time sounded nice. And as it happened, I knew what kitfo was: In the 1970s my mother had collected the Time-Life book series “Foods of the World,’’ and I dimly remembered a photograph of a large bowl of raw minced beef in “African Cooking,’’ by Laurens van der Post. A sort of African steak tartare, kitfo was, I recalled, a great delicacy. Solomon took us to a bare, cement hut somewhere in the Mercato. Two or three men stood behind a large butcher’s block upon which lay a hunk of purple, marbled meat and a series of blue plastic bowls filled with spices, peppers, and bulbs. There were one or two tables; a pair of well-dressed men sat quietly eating. The mood was faintly sacramental, which made sense, I thought: We were about to eat the most expensive means of production in an agricultural society. One of the men began chopping two small pieces of meat. As the man chopped, Solomon explained the preparation. The minced beef was mixed with warmed niteh kebeh, a clear oil of clarified butter that had been cooked with garlic, onion, ginger, turmeric, cardamom, cinnamon, cloves, and nutmeg. The raw meat and warm butter mixture was further combined with lemon juice and berbere, a dense paste of red chiles and the same spices that scented the clarified butter. Finally, the kitfo was piled into bowls and placed, with spoons, before my girlfriend, Solomon, and me. Inside the gloomy hut there was the smell of spices and warm, recently-slaughtered flesh. Outside, there was dust and noise and the misery of beggars, and you might as well have Leonard Cohen playing on a tinny radio. My girlfriend looked spooked. “Can we really eat this?’’ she said. I was very high. Flies buzzed around my face. My gorge rose. But the friendly men grinned, expectantly. I leaned forward and tasted the kitfo. It was sublime. Boston to Addis Ababa, filling station to church basement, travelers recall their unforgettable meals from around the globe. Discuss Have you had great food in unexpected places?